During the Selnec era, quite a number of ex-Salford buses were transferred to the former Manchester Corporation Depot at Queens Road. Most of these were Leyland Atlanteans and PD2’s, which would be quite at home among the ex-Manchester Leylands based here, although I wondered what the Queens Road crews made of the forward entrances on the PD2’s. 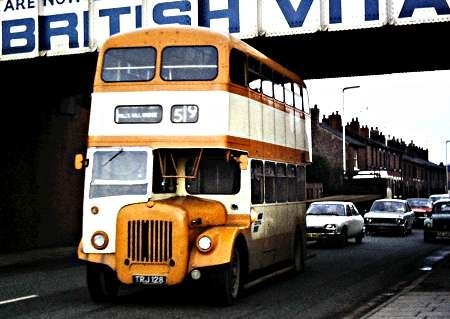 4017 (ex-Salford 128) was one of a handful of CVG6’s which moved from Salford to Queens Road. The latter depot had been home to Manchester’s only manual gearbox Daimlers, 4650 – 4, and occasionally elderly CVG6’s had spent their last days at Queens Road Depot on peak hour workings. However Queens Road was a firmly Leyland Depot, and I sometimes wonder how many drivers here were trained to use the preselector gearbox. The bus is seen at Mills Hill Bridge, which had traditionally been the boundary between the operating areas of Manchester and Oldham Corporations. It was the half way point on service 59 (Manchester – Middleton – Oldham – Shaw) which was normally operated by 6 buses from each fleet. However on Sunday Mornings in pre Selnec times, the service was operated in two halves with passengers changing buses at Mills Hill Bridge. Both operators ran short workings to this point, Oldham as service 3 and Manchester as 59X. Note the very small print on the standard Selnec destination blind. Obviously its a matter of opinion, but I thought the ‘Orion’ body suited the Selnec livery quite well. The manual CCG6 Daimlers made sweet music after the fashion of Guy Arabs – whose gearbox they shared – but were universally loathed by both Salford and Manchester drivers. [Apparently the Daimler installation worked less well than Guy’s own.] You’re not the only one, Don, who thinks an Orion can look good with the correct livery. What an interesting view! Thanks for posting, Don. Unlike most of the new PTE operations, which simply extended the livery of the biggest constituent with little or no variation, SELNEC went for a completely new livery. Some liked it, some were appalled, but they couldn’t ignore it. More orange below the lower deck windows may have helped to placate some observers – but it might have annoyed some of them even more! Would the (ex-)Salford CVGs have had air or spring-operated pre-selector gears? And why the split in the Sunday am service? a perception for the need for differing frequencies from each municipality perhaps?? . . . but with practices like that – and Oldham giving their half of the Sunday morning shorts a different number altogether – is it any wonder passengers went elsewhere? Now, I’ve never driven a pre-selector: does it require "training" or can it be picked up "on the job"? are there aspects of driving manual/clash/crash/synchro/whatever that need to be put aside when driving a pre-selector? I must admit that I’ve felt wary of going near a pre-selector ever since I read about that nasty "kick-back" habit of spring-change pre-selectors . . . then again, I’ve enough trouble with throttle/clutch/shift without the added complication of shift/throttle/change (am I right there?). As an "amateur" with about twenty years experience of using my PSV (PCV) for various things – in fact most types of operation – I would say that type training is an essential but often overlooked element of the job. In an ideal world, that includes the difference between Synchro Manual, Crash Manual, Semi Automatic and Pre Select gear change. The Orion bodied vehicles probably came out best of all with the SELNEC livery, primarily because as there were more of this style of body than any other across the fleets absorbed into SELNEC, the final livery from a number of options was actually designed around drawings and hand made models of the body style (don’t forget this was before computer graphics) and the dimensions and spacings of the colours were then adopted fleet wide to the benefit of a few other body styles and the detriment of many. The orange was, however, distinctive and, to be controversial, not dull as it appeared to be in the shades and quantities chosen for Cardiff or Glasgow. The photo highlights a number of issues. It would have been rare for a Salford or Manchester vehicle to be out on service for long with damage as seen on the radiator housing. The blind was a lash up job and, as there doesn’t seem to be any snow around, it looks as if the bus hasn’t been through the washer for some days. These were some of the problems faced by the new entity for some time after set up as old loyalties were, as one inspector said to me, smashed and blown to the four winds and some depots had almost a rebellious attitude to the new organisation. In addition there was a range of problems when transferring vehicles from depot to depot such as blind sizes. unfamiliar position of bells on rear entrance double deckers, position of fuel fillers and different interior light bulbs and of course different gear boxes, to name a few. The appearance of many vehicles rapidly deteriorated. Those left in their original schemes with the appropriate divisional motifs added (the Central blue S flash on Manchester’s red or Salford’s green looking particularly odd) were generally left without attention to dints and paint deterioration until full repaint, some waiting two or three years for attention or for withdrawal. All this added to the debate about the orange, which was by no means confined to the enthusiast fraternity, gave the management plenty to cope wit. Much had settled by 1973, then there was another upheaval with the advent of Greater Manchester Transport. I fully agree with the SELNEC livery looking good on the Orion. The original orange, sunglow I think it was called, was a very intense yellowish shade which looked especially attractive when freshly applied. However, it was prone to fading so that when the fleet was rebranded it was replaced with a darker, redder version. The difference can be seen quite well on these ex SHMD Daimlers: www.flickr.com/photos/ The off-white originally used was also replaced by brilliant white at some stage. I personally preferred the former combination but as livery is often a controversial subject that is a matter of opinion. The PTE liveries are often maligned but some of them worked well and looked bright and refreshing on the right vehicles at the right time. I always liked the original WYPTE ‘Metro’ livery with the stripe above the cab on the Roe bodied Atlanteans but on older vehicles it looked wrong. Merseyside used the same bluish Verona green which I thought looked very smart combined with jonquil yellow (a shade similar to the primrose used by East Yorkshire), especially on their Panthers. And, the final version of the Tyne and Wear livery with white rather than cream and royal blue lining has always been a personal favourite, especially on the Metropolitans. However, I would never deny that it was also something of a tragedy that magnificent liveries such as those at Halifax, Southport or South Shields were lost, and like the NBC liveries of the day, those of the PTEs were not helped by the loss of local pride that came with these huge, impersonal organisations. The question of appearance is highly subjective, but I remain an unapologetic loather of the Selnec ‘livery’ which looked particularly abhorrent when applied to front engined buses. The painting of the bonnet in orange, completely out of sympathy with the other lines of the scheme, made it look as absurdly conspicuous as a pantomime pirate’s eye patch. I have always disliked the Orion body, too. The straight taper from skirt panels to roofline, accentuated by the shallow upper saloon windows, gave the thing a gawky, ungainly, pin headed profile, which the cheap looking dome and glazing method merely compounded. Orange is a very tricky colour to adopt and maintain, as my time in Halifax revealed. HPTD buses emerging from the bodyshop with newly painted replacement lower panels resembled a patchwork quilt. Certainly, the Selnec scheme shows up body damage like a beacon. Salford would never have left the radiator cowl in that state, but even if it had, the missing slat would not have leapt so readily to the eye in that superb dark green livery. I will now don my hard hat in readiness for the onslaught from Selnec and Orion aficionados. I fully agree with Roger Cox regarding the SELNEC orange and white colour scheme it was one that was only ever going to look even reasonable when just out of the paint shop, considering the number of attractive colour schemes SELNEC inherited, MCTD’s being one of the least attractive, there were reasons to expect so much better. The Orion body was also an unattractive bus as it was unbalanced with the unequal depth windows and the inward taper from skirt to roof making it look very narrow and slab sided which looked even worse on a Regent V with a full front, the nasty tinny domes only made matters worse. Having said that if nobody had bought them how long would the design have lasted let alone been copied by Park Royal who managed to make a bad design even worse. The livery certainly accentuates the Salford style of winding handles attached to a cumbersome-looking frame, designed to be reached without the need for the guard (sic)to climb on the radiator. The "tinny" domes were actually fibreglass with the outside smoothed and the inside almost always left rough so the passengers could view the fibres through the paint. They were prone to loads of condensation and vibration and used to crack to a greater or lesser extent. Manchester had many delivered with v shaped push window vents in the two front windows which helped the frontal appearance but they were removed and later orders had them omitted as, if the vents became stiff to move, the efforts of the passengers or guard to open or close them led to the whole window flexing and there were instances of major cracking and windows falling out as a result. Great to see a Middleton run featured and thanks Don for posting. Re the 3 and 59: the 3 (Oldham Corp) was Rushcroft to Mills Hill only. In 1968/9 every journey was extended to Middleton. All Sunday morning 59 runs were numbered 59x and ran only to Mills Hill until 11am, then through to Shaw. There were few passengers. Middleton had interesting routes and short workings, mostly forgotten now. Selnec livery? Yuk! Lots preferred the original liveries. These Daimlers were stunning when new teaming along the Crescent and better still if all the lights from Adelphi to Blackfriars were green. Mike, in my day as a teenager, the longer it took from Adelphi to Blackfriars the better, especially on a weekday afternoon in term time – go figure! To answer one of Philip’s questions, I’m pretty sure that all Salford CVG6s had spring-operated gearchanges. The spring operation went with vacuum brakes, whereas air operation went with air brakes. Salford stuck with vacuum brakes as long as possible, buying PD2/40s when their allegiance changed to Leyland. I would imagine their CCG6s were vacuum braked too, whereas Manchester’s were definitely air-braked. Talking of which (David), I didn’t know the Guy gearbox behaved differently in these than in its native Arab. I wonder if it was perhaps in the wrong place. Guy always put it amidships, so if Daimler put it at the front, it would need a different linkage. Whilst it is very nearly true that they were universally loathed, there was one driver who loved them – a certain Ron Barton, whose book "Manchester Buses from the Platform" has just been published. I haven’t read it, but I should be rather surprised if he doesn’t mention the CCG6s. There was nothing wrong with the Guy gearbox. The constant mesh box was always disliked in fleets with a preponderance of preselective, semi auto or even synchromesh transmissions. The constant mesh gearbox required a degree of familiarity and skill for clean changes that drivers in mixed fleets did not (or could not be bothered to) acquire. The staff in neighbouring Tilling or BET fleets would have wondered what all the fuss was about. I like the way this is wandering into the realms of the merits or otherwise of different gearbox arrangements! In mid career, my duties with Southampton City Council began to involve what had been the Transport Department (by 1990 well into the deregulation era) and I encountered someone who was about to retire from that undertaking. He was telling me one day that he had started work with Provincial. All crash gearboxes. His instructor had mentioned – vaguely – double declutching, and had dismissed the idea as being for amateurs. "Listen to the engine, boy, and you can go straight through!" How would today’s drivers manage??? As a former employee based at the Weaste Garage. The transfer of Salford vehicles to Manchester Queens Road due to the interest being shown by the ‘Ministry’ in the ‘presentation’ of Manchester vehicles. To placate the ‘Ministry’ overnight Salford vehicles in good order were transferred to Queens Road and conversely Queen Road relics arrived at Weaste and Frederick Rd. To say the least engineering at the former Salford undertaking were not the least happy with the transfer. Could someone confirm that Salford Daimlers 111-146 had spring operated gearboxes and vacuum brakes? Selnec livery. As a student in Manchester in the early 1970’s I was recruited by SELNEC to assist with an evening survey in Wythenshawe. Being a loyal employee, I equipped myself with a felt tip pen in Selnec’s house colour, orange, to complete my survey forms. I rapidly discovered that the neon street lighting in Wythenshawe made the form itself orange which meant that it was impossible to see whether anything had been written. My early comments (16.01.14) about gearbox set-up were purely hearsay on my part. Having subsequently driven a "crash" Guy, I would say that (once one has learned to drive it properly) it was one of the sweetest gear-changes I have come across.